All My Sons, produced in New York in 1947, was Arthur Miller’s second Broadway play and the one that rocketed him to fame. With his first, The Man Who Had All the Luck produced there three years earlier, the 29-year old Miller had had anything but – luck, that is. Despite winning a Theatre Guild's National Award in 1940, The Man Who Had All the Luck had disastrous reviews and closed on Broadway after four performances. A chastened Miller spent the years ’45 and ’46 writing and honing All My Sons, determined it would not suffer the same fate.. or, if it did, he’d give up playwrighting altogether. As preparation, he trialled the play out of town to groups of GIs. They liked it and he grew confident he had a good story. Why GIs? Well, the background to All My Sons is World War 2 … where men and women fought and died overseas, and others – businessmen particularly – made their fortunes, or built upon them, by fulfilling lucrative government contracts to produce the components, machines, weapons that those soldiers abroad were using to fight with. Those fortunate ones at home could, of course, justify their positions by saying they were just fulfilling the American Dream – wealth, prosperity, financial security – and indeed, by helping keep the country free – they were helping others to achieve the Dream also. So, who are the “others” to whom responsibility is owed? For Joe Keller, the neighbourhood “hero” of our story, a wealthy businessman whose factory produced aircraft components for war, the “others” are his immediate family, his wife Kate and his two sons Larry and Chris – it is for their benefit that he has worked as he has – has done what he felt he had to do during the tough times. At the start of the play we soon learn that Larry, a pilot in the war, has gone missing in action. Though Kate refuses to believe Larry is dead, Joe and Chris have accepted it – and it’s all the more reason for Joe, on the brink of retirement, to pin all his hopes on Chris taking over the business and securing the family fortunes for the future. And so is the ground laid for a showdown between father and son – when the son learns how his father has shirked his responsibility. Shirked? This rich and compelling story is more than that, but let’s not give the plot away. 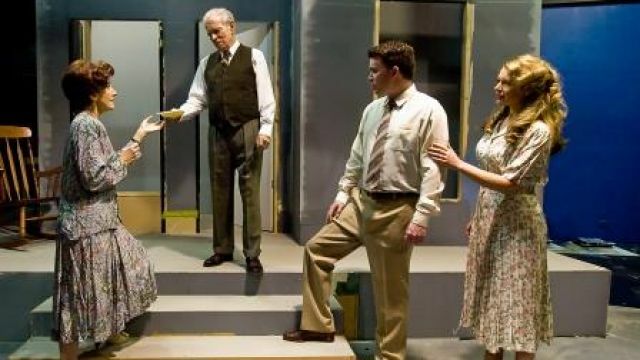 All My Sons features many performers who have appeared in previous HTC productions. George Werther (Rumours; The Two of Us; Glengarry Glen Ross; Grace) plays factory owner Joe Keller; Julie Arnold (The Dresser; Little Murders; True Minds) is Joe’s wife Kate Keller, while Liam Gillespie (One Man, Two Guvnors) plays Joe’s son Chris Keller. Claire Abagia (Pride & Prejudice) is Ann Deever – in love with Chris, and Xavier Ryan (The Philadelphia Story; The Business of Murder; Three Sisters; Twelve Angry Men) plays Ann’s brother, New York lawyer, George Deever. Tim Camilleri (Rosencrantz and Guildenstern are Dead; The Lion in Winter) returns to our stage as the Keller’s next door neighbour, Frank Lubey, and Gavin Baker (The Dresser; August-Orange County; When Dad Married Fury; Don’t Dress for Dinner; One Man, Two Guvnors) plays Doctor Jim Bayliss, next door neighbour on the other side. The cast also features some newcomers to HTC. Sallyanne Mitchell, who also enjoys performing in musical theatre, will appear as Sue Bayliss, Jim’s wife. Kate Manicom will play Frank Lubey’s wife Lydia. Francesco Basile will play young Bert. In his fifth production with HTC, director Chris McLean is very thankful of the support of an experienced production team: Production Co-ordinator Margaret Hassall, Stage Manager Melanie Belcher, Costume Designer Wendy Drowley and Properties Manager Bronwyn Parker. Lighting and Sound are in the very capable hands of Deryk Hartwick and Rob Wanless respectively. Set Construction is coordinated by Owen Evans, and the set artist in Marie Mackrell. This production is dedicated to Neville Wilkie who passed away on Thursday May 4 this year. Neville was with the Company for the last eight years, and was valued for the special properties and furniture he created for so many of our productions. 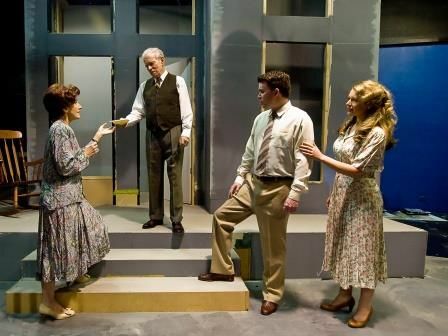 Image: (from left): Kate (Julie Arnold) is given the letter by her husband Joe Keller (George Werther), with Chris Keller (Liam Gillespie) and Ann Deever (Claire Abagia). Photographer: David Belton. Group of 10+ - $22 per ticket. Special -Groups 50+ - $10 per ticket.